New Delhi: In these times, when walls are being built as partitions between families and countries, a wall in Bhilwara district of Rajasthan state is bringing people closer to one another. An offshoot of the discussion between a common man and the administration, the wall with graffiti is being thronged by both the well-off and the poor — albeit for different reasons. 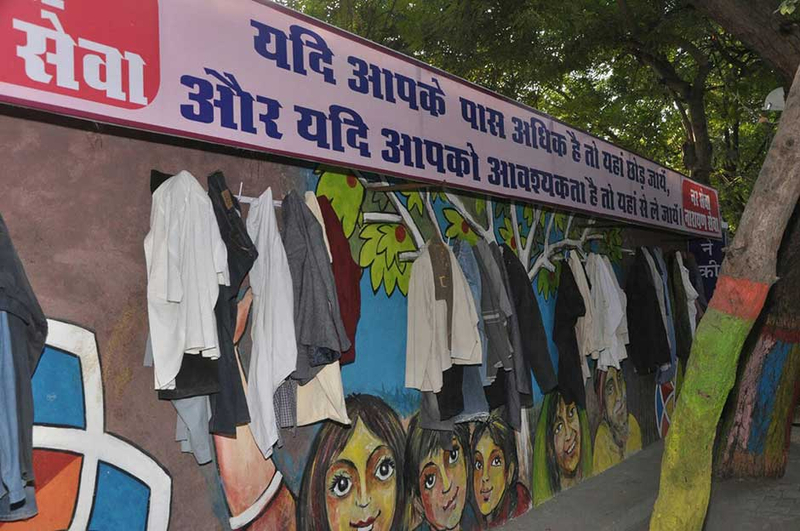 The colourful wall, known as ‘the wall of kindness’, is an effort of some thoughtful government officials to provide clothing to the poor, donated by those who have surplus number of clothes, which they do not use because the colour has faded or it does not fit well. The initiative began at the behest of Prakash Nawal, a development officer in a government-owned insurance company in Bhilwara. Nawal explains, “A simple slogan, ‘Leave what you don’t need, take it if you need’ caught my attention on a television news channel one evening. The report showed a painted wall and some clothes hung on hooks. The message above a row of hooks read, ‘Wall of Kindness’ and people donated unwanted clothing, which were taken away by the poor to wear. Naval discussed the idea with his wife, Vandana, and the couple approached Pradeep Singh, Secretary, Urban Improvement Trust (UIT) Government of Rajasthan, to ask if something similar, along the lines of the charity wall in Iran, could be worked out in the vicinity of their house. The UIT official was immediately drawn to the very simple model that would enable the well-off to share their discarded clothes with the poor who had no such luxury to pick and choose. In no time, he decided to start such an initiative in Bhilwara. Once the section was ready, the administrative team hung some of their unwanted shirts and trousers on hangars and hooks and decided to wait and watch the scenario. Towards the evening, the official and his team found some labourers trying out those clothes. The most significant part was watching the poor men keep back the clothes that did not fit them. The enclosure has never been kept locked and no one guards the wall, but not a single case of looting has come to the administration’s notice. As a result, the team went a step ahead and placed small shelves for shoes, utensils, books and school bags in the arena. While it helped women pick up utensils; children were seen choosing books and school bags. “Surprisingly, there was no dearth of items, especially garments, which kept piling up in the coming weeks and I was left with no choice, but to move bundles of clothes to my office,” Singh said, laughing. Spurred by the enthusiasm and the success of the scheme, he decided to come up with another such charity wall. People expected the plan to fizzle out after some weeks. But the massive response received from both — the givers, who continued to donate clothes, and the takers, who picked up what they needed, left Singh and his team overwhelmed. They had to rope in an NGO that now takes care of the bulk of donated clothes and ensures these are washed and ironed before being hung on the hooks for the needy to take away and wear.